Playing football is where my kids find their joy. It’s always the season they look forward to the most and when the season is over, there’s always a bit of sadness. And while there are plenty of opportunities to play football in the winter or spring, the belief in our household is that when a season is over it’s time to move onto the next sport season. 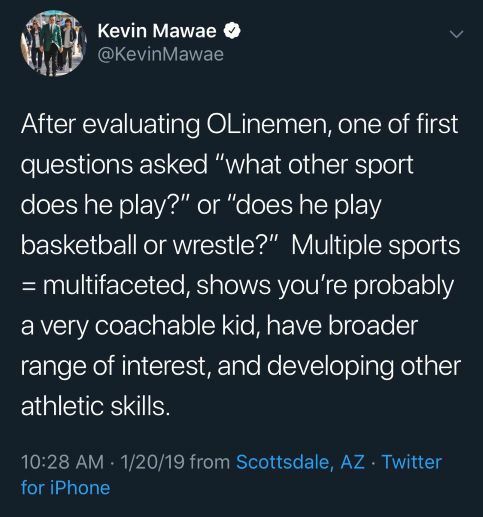 Giving our kids the opportunity to experience multiple sports is something that my wife and I feel strongly about. This past weekend the sentiment was echoed on Twitter from two prominent professional athletes. 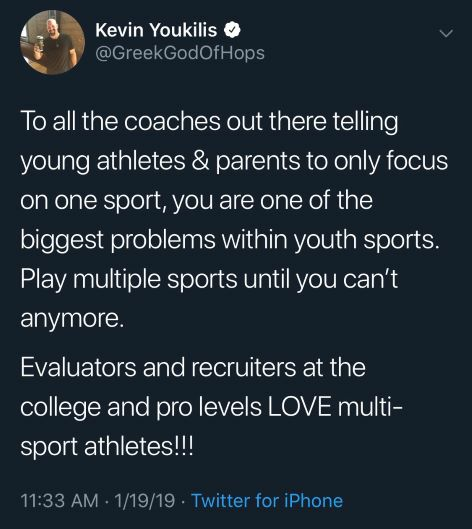 And believe me, there are parents and coaches in other sports that say the same things, but most people involved in youth sports would say that playing multiple sports is the right path to lead your child down. Don’t get me wrong, I love the youth football season, but I’m really looking forward to seeing Bradley wrestle next month and to see Jared play little league again this spring. You might have an idea of what your child’s best sport will be at a young age, but you shouldn’t deprive him or her of the opportunity to try other sports.